As the federal government moves to investigate the perceived harm that affirmative action has inflicted on white college hopefuls, it’s important to separate truth from fiction. This investigation is powered largely by myths. The truth is, people of color continue to face barriers to higher education and economic stability. And affirmative action hasn’t gone far enough in removing those barriers. Reality: Decades of data show that white women are the primary beneficiaries of affirmative action policies. So white women get the economic stability that comes with removing unjust barriers to success, but people of color continue to miss out. Reality: Harvard University recently made headlines because its incoming freshman class is less than 50 percent white for the first time in its history. However, most college and universities aren’t following that trend. And while the white-Latinx college enrollment gap has narrowed over the last decade, the white-Black enrollment gap has not. Higher education remains predominantly available to white people. Reality: Nationwide, just under 40 percent of Black 25- to 55-year-olds carry student loan debt. The number drops to around 30 percent for Latinx and white people. But the incidence of student loan debt isn’t the sole issue. There’s also a wide racial gap in average debt amounts. Black students and their families incur twice as much student loan debt upon graduation. According to a 2016 Brookings Institute report, four years after graduation the Black-white debt gap more than triples from $7,400 to $24,720. Instead of intergenerational wealth, communities of color are more likely to suffer intergenerational debt. And as North Carolina tuition costs continue to rise, this problem will worsen and the barriers to racial equity will grow. Nearly two-thirds of North Carolina college graduates collect student loan debt along with their degrees. Meanwhile, state funding for public universities has declined since 2008, which puts the burden of funding on tuition-paying students and their families. And the debt amounts bear that burden out. Over the past 10 years, the average student loan debt has increased from roughly $16,000 to $25,000. Meanwhile the median income in our state has barely budged. So while the federal government continues to question minority students’ presence in colleges, those same students are increasingly getting priced out of a college education and the ladder to the middle class that that education used to provide. Marion Johnson is a Policy Advocate with the Budget & Tax Center, a project of the NC Justice Center. EITC momentum is picking up across the nation. Montana and South Carolina have both enacted state EITC laws, while Hawai’i’s passed the state legislature and just awaits for the governor’s signature. Two other states have passed bills to expand access or participation rates. States across the country are getting the message: working families need the EITC. NC lawmakers should start listening. Click here for the original statement from TCWF. President Trump vowed to support working families by beefing up crucial supports like the Earned Income Tax Credit (EITC) and Child Tax Credit (CTC). In an unsurprising twist, Trump has reneged on that promise and proposed slashing the EITC and CTC by $40 billion. Instead of supporting working families, he’s proposing raising taxes on the most vulnerable. The 22 percent of North Carolina households who qualify for these income tax supports are working hard to raise their children and put food on the table. In stark contrast, the President’s budget proposes tax cuts for the country’s wealthiest taxpayers and estates. Working family tax credits pay off in the short term by alleviating poverty. They also produce long term benefits. Low-income families receiving supports such as the EITC tend to have improved infant and maternal health, better school performance and college enrollment, and increased work and earnings in the next generation. This budget proposal shifts a huge burden of responsibility onto state governments. Not the least of which will be renewed urgency for state leaders to establish a state Earned Income Tax Credit. As I wrote about last week, we’ve just fallen behind South Carolina in this regard. The White House has made it clear that it won’t prioritize working families. Instead, it’s making it harder for them to make ends meet, while the wealthy get another break. North Carolina families need their lawmakers to embrace their responsibility to us all. We need leaders who understand that building a strong economy means making sure all families can thrive, not just rich ones. Marion Johnson is the Policy Advocate for the Budget & Tax Center, a project of the North Carolina Justice Center. Last week South Carolina lawmakers established a state Earned Income Tax Credit (EITC), which makes them the 27th state to do so. The state EITC finally happened when legislators raised the state’s gas tax for the first time in nearly 30 years to raise some much-needed transportation revenue. The drawback of gas taxes is that they’re generally regressive, meaning that they hit low-income taxpayers’ wallets hardest. So it’s crucial to find a way to balance raising infrastructure revenue with protecting working families. That’s where the Earned Income Tax Credit (EITC) comes in. It can provide a targeted way to ensure that the tax code doesn’t ask more from low- and middle-income taxpayers. 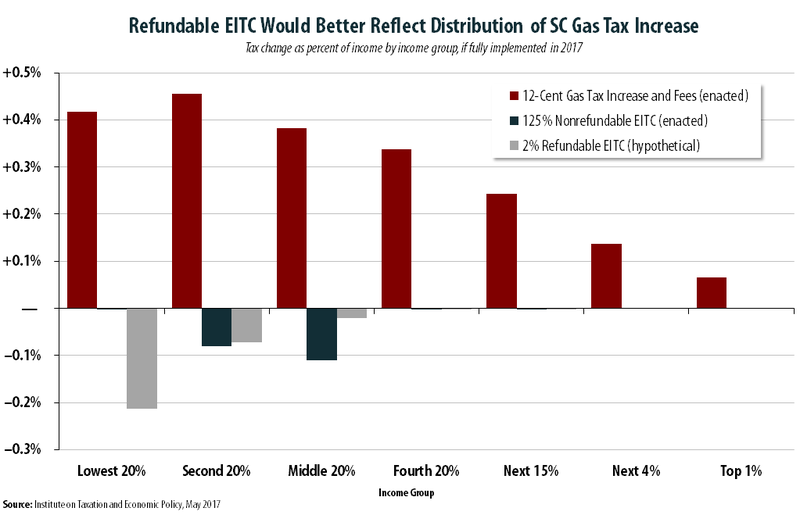 A refundable EITC — one that allows working families to reduce their state income tax liability and deliver a refund — helps balance out the gas tax’s regressive nature. This should sound familiar to those of us here in North Carolina. Our legislators have cut income taxes at the top while eliminating many credits and deductions, and expanding the sales tax. While they claim that increasing the standard deduction helps low-income taxpayers, it’s actually about as unhelpful as a non-refundable credit. Since it reduces taxes for 70 percent of North Carolina taxpayers, it serves to benefit wealthier and middle-income taxpayers. A state Earned Income Tax Credit is a critical step towards tax fairness and economic stability. The way South Carolina designed theirs is more of a stumble. The path is clear for the North Carolina House to once again lead in the Carolinas. We just need a better proposal for working and low-income families. The North Carolina Senate’s budget contains very few surprises. Their proposal includes more corporate and personal income tax cuts, which follows the trend of the last several years. In fact, NC lawmakers have been so consistent about pursuing costly tax cuts that they’ve lost the state about $3 billion in revenue. Half a million children in North Carolina are growing up in poverty. $3 billion would more than cover the $3,000 each child’s family would need to gain financial security. North Carolina now ranks 35th in the nation for average teacher pay, with an average salary of $49,837. This is an improvement over the last few years, but we’re still not close enough to our goal of reaching the national average. Doing that would take $1 billion. Sixteen percent of the state lives below the poverty line, but the rates are much higher in communities of color. It would take $1.2 billion to move 411,000 people of color in North Carolina out of poverty and close the racial poverty gap. There are currently 40,000 children in North Carolina eligible for pre-k but not receiving services. Placing all of those children in pre-k would cost $191 million each year, and would provide them with long-term education and earnings benefits. Our lawmakers could be building thriving communities and creating budgets that actually respond to our state’s needs. But since they’ve chosen to lose billions for the sake of tax cuts for the wealthy, now they literally can’t afford to make the right choices anymore.